Environmental Protection Agency Deputy Administrator Bob Perciasepe attended this January's Suppliers Partnership for the Environment first quarter meeting at the GM Renaissance Center in Detroit. ERA Environmental Management Solutions, as a member of the Suppliers Partnership and contributor to the SP's Materials Efficiency work group, had the honor of meeting Mr. Perciasepe in person at the event. 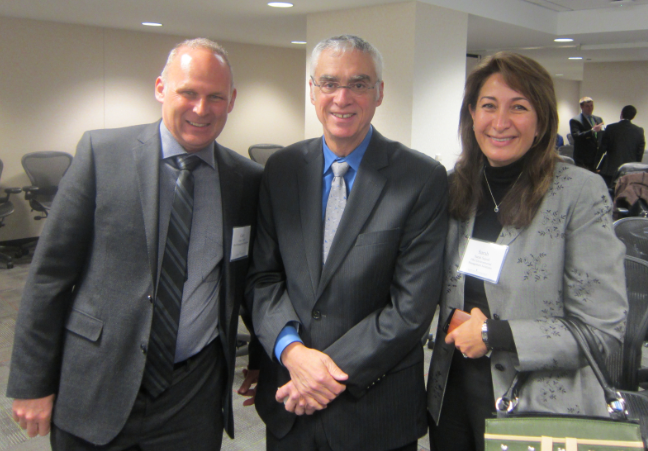 ERA Senior Toxicologist Gary Vegh left, EPA Deputy Administrator Bob Perciasepe center, ERA CEO Sarah Sajedi right at Supplier's Partnership 2014 first quarter meeting. At the quarterly meeting, EPA Deputy Administrator Perciasepe gave a talk on how the EPA and manufacturers are "Meeting the Challenges Ahead." This includes a new U.S. Government public-private Manufacturing Innovation Institute which will strengthen the manufacturing sector by boosting advanced manufacturing, and increasing the use of innovative technologies in the manufacturing industry (such as advanced Environmental Management System technologies). Mr. Perciasepe also acknowledged the hard work being performed by the Suppliers Partnership work groups and mentioned the recent EPA Green Chemistry Awards which generated a lot of buzz amongst companies embracing sustainable technologies. ERA Environmental Management Solutions' team was delighted to have the opportunity to meet with Mr. Perciasepe and to meet once again with our partners and colleagues in the Suppliers Partnership. This year we'll continue contributing to the Materials Efficiency work group by providing our expertise on material tracking throughout the automotive supply chain and life-cycle assessments.